The Ross-Laule rebuild on the way up. 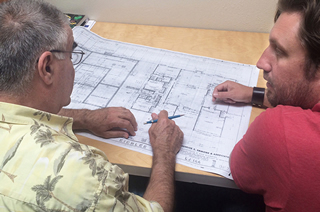 Bryan Ross and structural engineer Shucri Yaghi review the plans. Ross and Laule on location looking over a volcanic basalt tile for their unique two-way fireplace installation. Moving away even more from the pure Eichler look is the Klopf-Calvert rebuild in San Mateo. "It's Eichler inspired, but it's not a new Eichler," Klopf says. 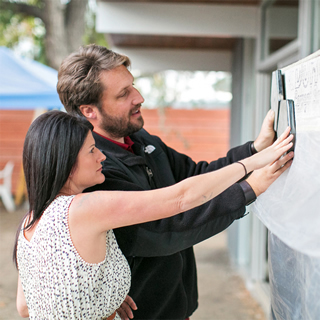 "I don't want to represent the house in San Mateo that way [as a true Eichler] at all." Yet it represents one option for rebuilding after an Eichler fire—creating something modern that fits into the neighborhood. 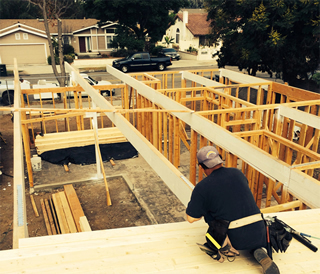 The house will be larger than the neighborhood's original Eichlers—2,500 to 2,600 square feet, plus garage. "It's about as big as the Atherton Eichlers, about as big as they got," he says. But, Klopf says, "It's going to have the same sort of setback and pattern as the rest of the neighborhood. It will be a little bit taller, but it will be in line with the character of the neighborhood. It shouldn't stand out when you drive down the street." For the home's design, "we took a lot of cues from the neighborhood and from an Eichler home, because I've worked on so many of them," he says. Klopf says he has remodeled or added to about 80 mid-century modern homes, including about 50 Eichlers. The project began when a buyer bought the lot, which had little left of the house—the chimney, garage, a few partial walls. "The owner didn't want a massive chimney with a wood-burning fireplace," Klopf says. "There was really nothing they wanted to preserve that would work with their lifestyle." The owner did want two master suites, the second for use by another family member. The result will be an L-shaped design with walls of glass opening onto a patio and yard. The second master suite will be separated from the main body of the house, on the other side of the garage. The atrium will get a custom 14-by-eight foot living wall. "We're trying to use the language of the mid-century modern period," Klopf says—"vertical board siding, the overhanging roof, the big walls of glass." There will be a 'recessed entry' that suggests the Eichler atrium. Ceilings will be tongue and groove, but the ceiling beams will be concealed. The people behind these fire rebuilds may not agree on aesthetics in all things, but all agree that replacement Eichlers can be built that are glass-walled and aesthetically compatible with the originals while following all modern codes and accommodating people's desires for contemporary living. But it takes some doing. "The glass was a big challenge," says Bryan Ross. "I was going back and forth with the city a lot on that one. How do you create the same feeling of the glass, yet make the rest of the structure stronger to allow it?"